Students at Rainford High benefitted from a year 11 group revision evening at the school recently, in a bid to prepare for them GCSE success next year. Staff invited students, along with their parents, after school hours where they could learn in detail about the importance of the qualifications and answer any questions or alleviate any concerns that they may have. The evening began with a presentation from principal Ian Young and key stage four staff, highlighting certain areas of GCSE revision, exams and results. 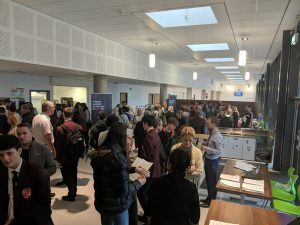 Following the talks, students and parents were then encouraged to visit over 10 different stalls which contained information dedicated to a specific aspect of GCSE success. From revision strategies and careers, to the importance of sleep, food and nutrition, each stall offered advice to students to ensure they try their very best next year, together with the right support from their parents. Hayleigh Turner, KS4 Achievement Coordinator at Rainford High, organised the event. She said: “Here at Rainford High, we feel it is so important that our year 11 cohort are given a glimpse into what to expect when it comes to their GCSEs. Principal Ian Young added: “Since the new grading system came into play, we have found parents and students alike are still a little confused by it. The evening allowed us to talk about this in detail as well as other important issues such as mental health and wellbeing.